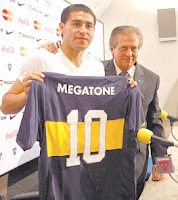 Boca Juniors held a press conference yesterday afternoon to announce the return of Juan Roman Riquelme to El Bombonera. Riquelme has initially signed a three-year deal with Boca, but suggested that he wishes to stay with the club for the rest of his playing career. The AFA are now lobbying FIFA to allow Riquelme to play for Boca in the World Club Championship, which Boca will leave for next Wednesday. FIFA initially rejected Boca's appeal, but with the weight of the Argentine Football Association behind the discussions, they seem relatively optimistic that Riquelme will be able to play in Japan. "My dream is to play the World-wide championship in Japan, I have the belief. It is the first time that an Argentine team will participate and I want to help not only our club, but Argentine soccer as a whole. Hopefully, I will be allowed to play, but today only we must enjoy this return." He may play some part in Boca's last game of the Apertura on Sunday, where they face league-leaders Lanus.